In the same way that I can't picture it being warm while it is the middle of winter, once summer arrives it seems as though I just can't remember the cold, blustery days of winter. Instead, kids are out of school, the sunlight lasts all day, and we have more chances to invite friends and family over for a backyard BBQ. After all, it doesn't matter if you are Martha Stewart or not, you simply need to pull together some food, drinks, a comfortable place to sit and your closest pals, right? It also never hurts to find ways to be inspired to turn your yard or deck into the perfect location for a celebration thanks to furnishings, decor, accessories, tools and more from Cost Plus World Market. It never fails that I can be only steps inside Cost Plus World Market and I already want to walk in three different directions. Their stylish selection of merchandise ranges from outdoor furniture to jewelry to picture frames to kitchenware to much, much more. I love seeing the various ways that they feature their items individually or together to give each customer an idea as to how every pillow, rug or stick of incense will fit into their own life. 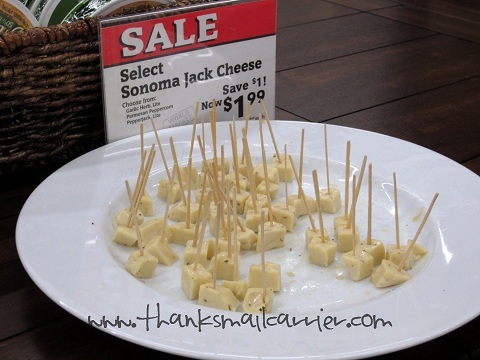 When it comes to planning for a backyard BBQ, World Market makes it easy and affordable. Whether you are a pro and just need to pick up a new grill brush or you are a novice and needs plates, glasses, chairs and the grill itself, this is one store that will allow you to pick up just about everything you need in one place (and within your budget). ...as well as shelf after shelf of drool-worthy accessories and just right finishing touches that can turn your BBQ from "just hanging out in the yard" to "ooh, now this is a party!" 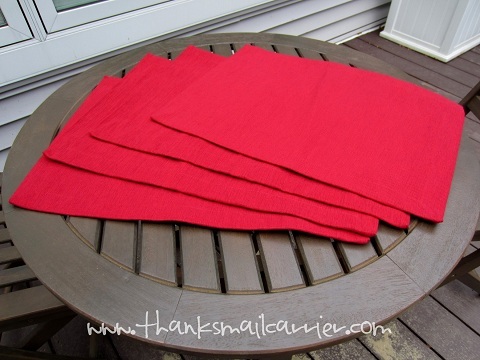 I love the idea of finishing a table with some great candles, colorful glasses or stylish (and washable!) 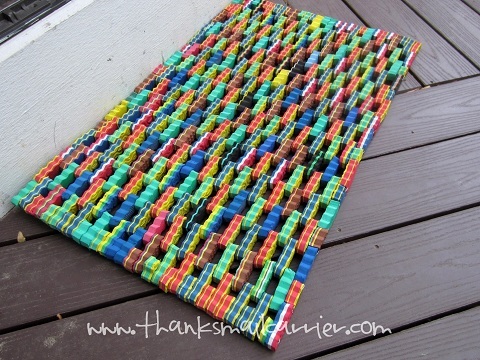 placemats. There are just so many to choose from! 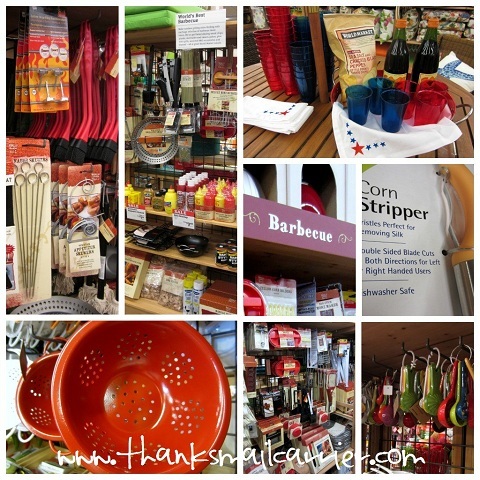 However, if the atmosphere of your yard or deck is already fashionable, then it might be time to look at the vast selection of BBQ tools, because I couldn't believe that World Market had quite so many to choose from. Many I had heard of before... others, I hadn't. 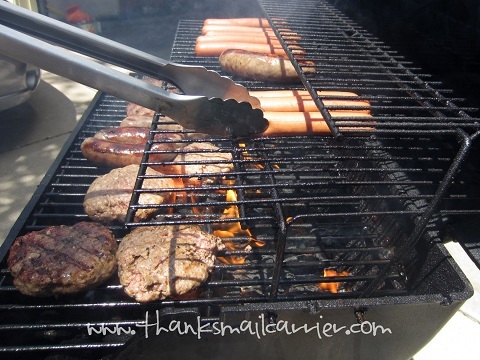 But I have no doubt that any good grill master would have been thrilled by just about any of them! 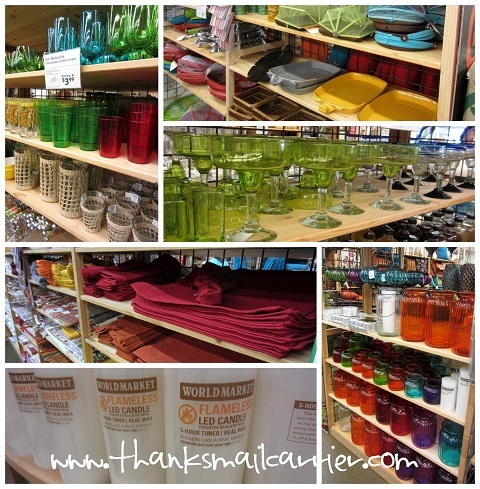 Finally, it's not possible to browse around Cost Plus World Market without coming across shelf after shelf of food and drinks to complete your party. I don't think I've ever been in the store without seeing someone happily purchasing a bottle of wine, a six-pack of beer, a bag of chips or a delicious block of cheese. Not sure which ones you'd like? That's what samples are for! ...but we still found plenty of food and drinks that would turn any regular menu into an outdoor feast. Yum! ...and the convenience of this stylish and easy-to-carry handled bucket for drinks. 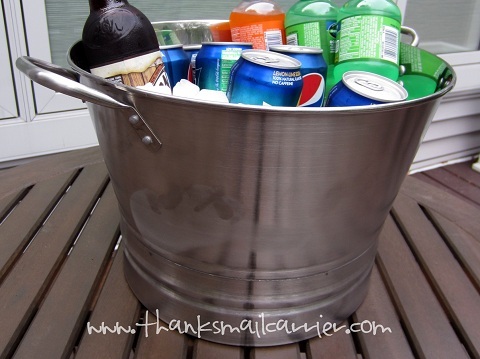 I love the idea of pulling this out and using it to offer guests a cold drink instead of having them dig around in a cooler! 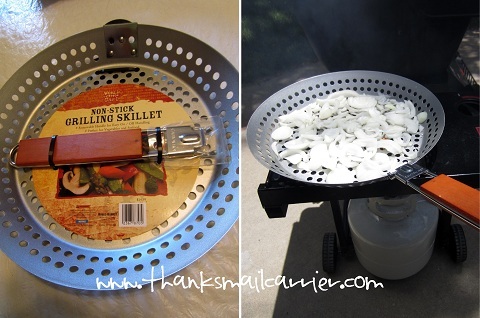 ...and then finished off with a Non-Stick Grilling Skillet that was put right to use for keeping any small vegetables from slipping down into the grill. No one wants to lose their onions down into the coals, now do they? All in all, our backyard BBQ wouldn't have been the same without Cost Plus World Market. 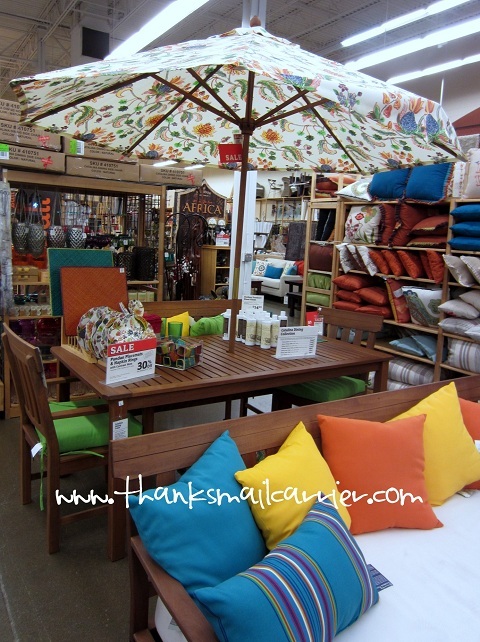 I already have a wishlist of items that would make our outdoor space even better and can't wait to return and shop for more of them next time! 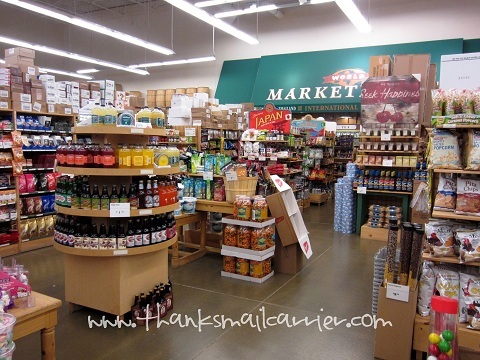 Whether you've just been in for a visit or you've never set foot in a Cost Plus World Market, you'll want to visit their website to browse their beautiful selection, latest ad, and to find a store location near you. 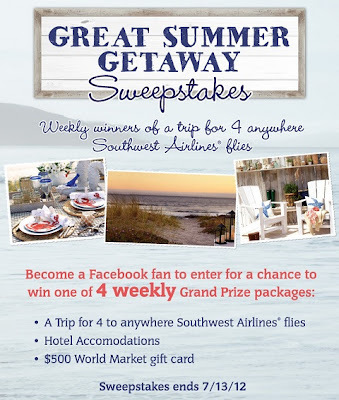 You'll also want to connect with them on Twitter and Facebook to keep up with the latest and greatest... as well as to enter their great Summer Getaway Sweepstakes that is going on now! That's right! 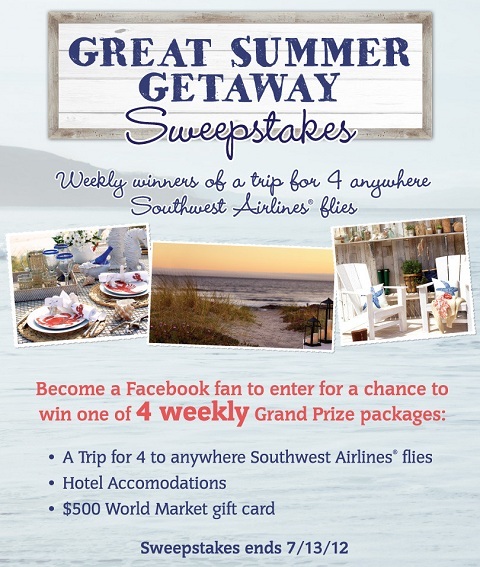 Each week Cost Plus World Market is giving away a trip for four anywhere Southwest Airlines flies, including hotel accommodations and a $500 World Market gift card. Head over to enter now! If that isn't enough travel excitement, World Market is also currently holding a fantastic Buy & Fly in-store promotion. Right now when you make a purchase of $20 or more, you will receive a 15% off coupon for Southwest Airlines to purchase a flight anywhere Southwest Airlines flies! Both of these great promotions run until July 13th, so don't miss the opportunity to enjoy all of the stylish options that Cost Plus World Market has to offer while setting your sights on the idea of jetting off to an exotic locale as well! This shop has been compensated by Cost Plus World Market, but all my opinions are honest and my own. That's a store I really miss not having here. :( I used to go a lot in Michigan. I like that handy dandy little skillet you got! They closed the one near me but I LOVE the store! I may have to go to the one that is farther away to get that Southwest deal and the cute things you bought! Oh, how I miss the World Market near me that's now closed. We scored our dining set there (for a steal!) and we get so many compliments on it. If I still had a location here, I'd jump in the car tonight and drive down to buy that wood patio set in your first photo. Gorgeous!